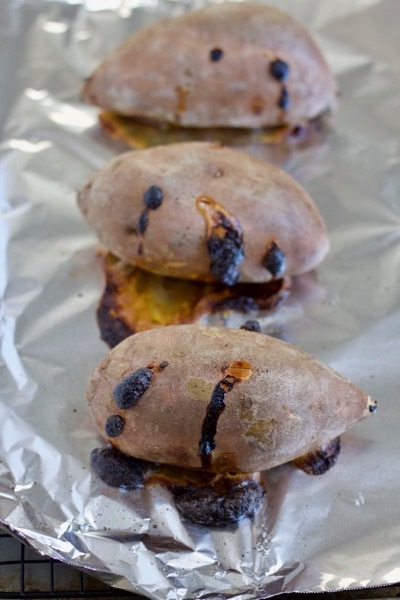 It feels a little silly to post a “recipe” for baked sweet potatoes. Like – poke some holes and stick ’em in the oven pretty much sums up the whole process. But if you’ve ever had the discouraging experience of baking potatoes for a dang long time only to discover that they’re still hard as rocks when the rest of your dinner is ready, you can appreciate this post! We live in North Carolina, which is the #1 sweet potato-producing state in the country. But even the NC Sweet Potato website is perpetuating the lies about how to bake a sweet potato: it says 400 degrees for 45-60 minutes, and unless you have itty-bitty sweet potatoes, that’s just not going to get the job done. Or, I mean, maybe I’m just a total pig girl who likes her vitamin A, but I don’t mess with the itty-bitty ones for baking! I look for good-sized potatoes – about 10-12 oz each. For this reason, I like to buy them from a bulk bin so I can choose the ones I want – hefty, and fairly uniform without a super wide or narrow end. If I buy a bag with small ones or a range of sizes, I usually use the outliers for roasted sweet potatoes! So: I highly, highly recommend cranking your oven up to 450, scrubbing and piercing some good-sized sweet potatoes, and baking them for a solid hour. They need the extra heat to be completely soft and tender all the way through – fork-mashable, easy to separate from the skin, perfect baked sweet potatoes. I recently discovered the trick of adding a cooling rack to my sheet pan to keep the sweet potatoes from getting a dark spot where they rest on the pan. A piece of foil is essential for easy clean-up! 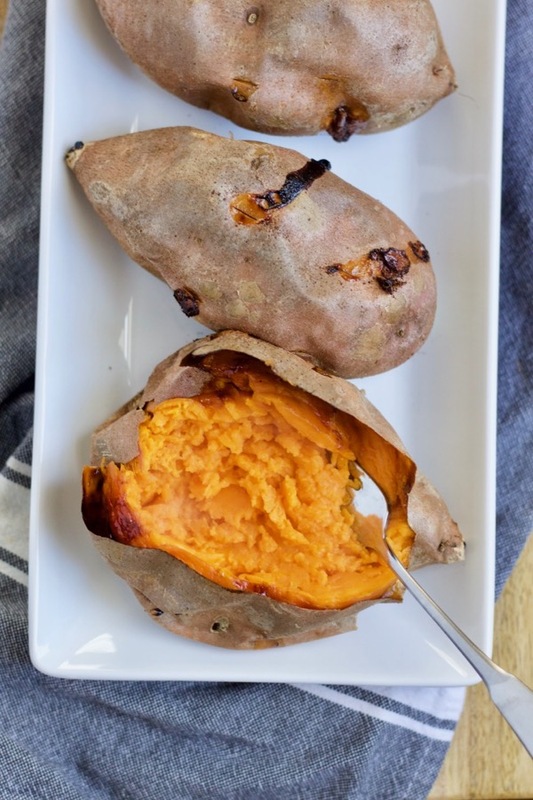 At the hour mark, the baked sweet potatoes will be oozing molten, syrupy juices that bubble into sweet potato caramel on the foil – a good indicator that they’re ready! (Don’t worry if it turns black like above – most of it brushes right off the outside of the potatoes.) 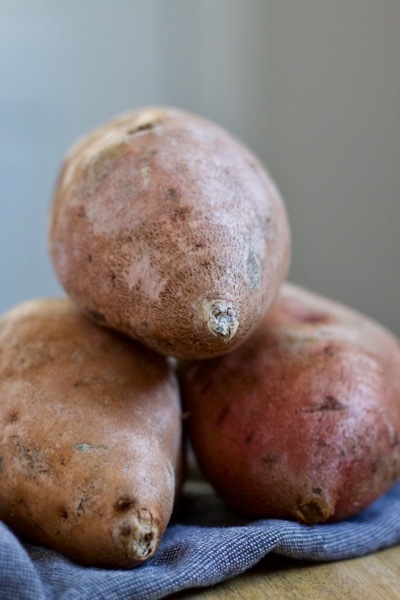 The sweet potatoes should be tender and give easily when you squeeze them, and the skin may even pucker a little or seem loose. They’re ready to split open and doctor up! I love to keep it simple with a little butter and a sprinkle of kosher salt, maybe some cinnamon – the flavor and texture is so good already! If you want something extra special, I’m drooling over Joy the Baker’s oat-and-pistachio crumble topping, and Sally’s Baking Addiction has a sweet potato skins recipe with cheese and bacon that looks heavenly! Oh, and I usually bake a few extra taters while I’m at it, because they’re great reheated! I store them in their skins, and then scoop the insides out onto a plate, mash it up a little with a fork, and warm them in the microwave. They make a tasty lunch or easy dinner side later in the week! Preheat the oven to 450. Scrub the potatoes and pierce them several times with the tip of a knife. 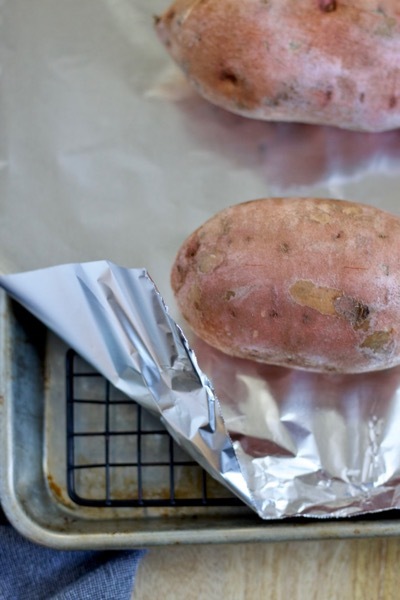 Place them on a foil-lined baking sheet with a cooling rack under the foil (or, if you are fitting them in around something else in the oven, you can also form a little tray around each one with a piece of foil and bake them right on the rack). Bake for 1 hour, turning them once or twice (this is important only if you don’t use a rack, since it will keep them from getting a little blackened spot on the side that’s touching the pan, but I honestly rarely remember to do it). When they’re done, they will be very tender when you squeeze them and will be leaking sweet, syrupy potato juice that may be bubbling and turning brown and caramel-ly. The skin may also look loose or pucker a bit. Be careful when you cut them open, since they will be steamy hot inside! 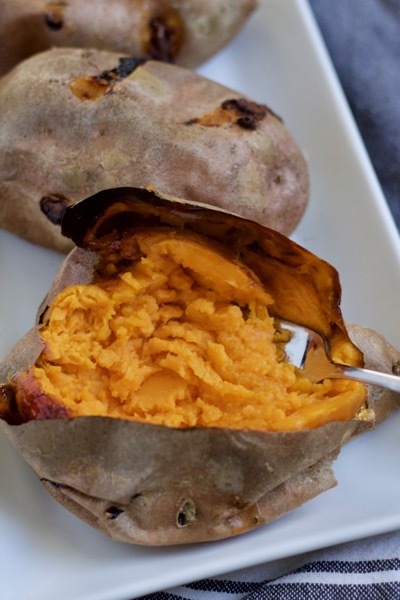 Baked sweet potatoes reheat well, so make some extras for later in the week! (I warm leftover sweet potatoes in the microwave.) I like to bake them rather than boil them prior to making mashed or whipped sweet potatoes, too, so you don’t have to peel or cut them up raw, and so you don’t lose any nutrients in the water! So good. I always just make the other kind you do because I never know how to get them baked properly. Yay. Now I can have actual baked sweet potatoes too! Thanks! Thanks Bet! I feel like I try them a different temp and time each time I make them, but now I will use this as my guaranteed method. Sometimes we bake our big ones at 400 for almost 2 hours with no major consequences! Or turn the oven off at an hour and leave em’ in the oven.